I enjoyed a simple yet fun creative project this evening. When Greg and I emptied out his patents’ house, after his father’s death, we packed up an old set of encyclopedias and a Book of Knowledge set, from 1951. In this age of smart phones and Google, who uses encyclopedias any more? No one. We checked to see if there was a market for selling such vintage volumes. There wasn’t. Sets like these can be found in flea markets and yards sales everywhere…and you can’t hardly give them away. We decided to haul the sets to Joplin and keep them. I am so glad we did. During this year of inspiration, several of my creative projects have been created using pages cut from the volumes. As I stayed open today, to how I would play creatively or embrace tenderness, images began to pop into my head. 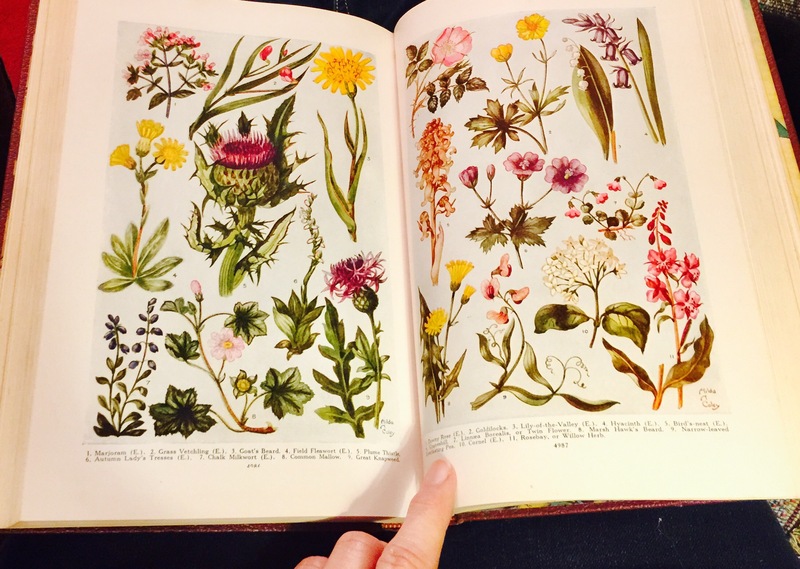 I recalled seeing beautifully colored pages of flowers in one of the books. I seemed to remember that Scotland’s national flower, the thistle, was included. When I had time to search through the old books, I couldn’t locate what I remembered seeing. I was questioning my visual “download”, and considering a plan B, when my attention was drawn to the Book of Knowledge set. I had been skimming through the encyclopedias. In a few moments, I had located the correct pages. And I was right. There were several thistles included. I love the patina of these glossy pages. The flowers are gorgeous watercolor reproductions. 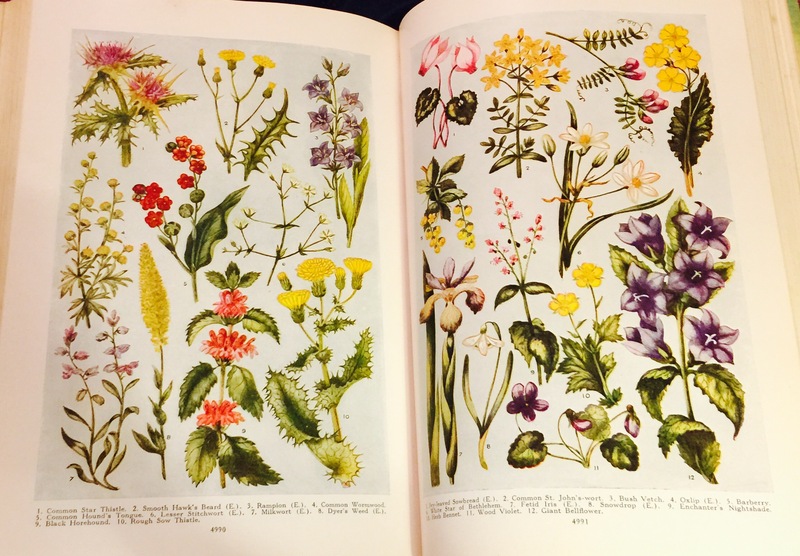 I have looked for such vintage prints for years. And here they were, in a set of old books. Being 66 years old qualifies them as vintage, I think! Using a craft knife, I carefully cut three pages from the book. 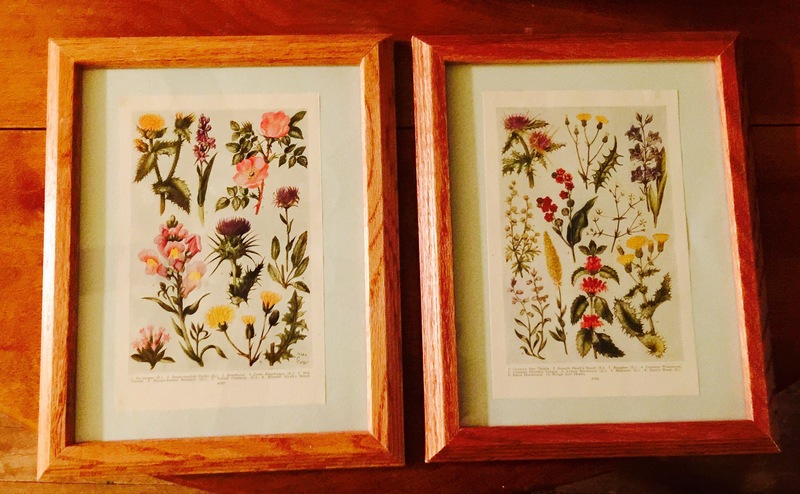 I have a stash of empty frames in my art closet, and selected two suitable wooden frames. I also have a drawerful of parchment type paper, in a variety of colors. I selected a pale blue paper, to complement the background color behind the flowers drawings. 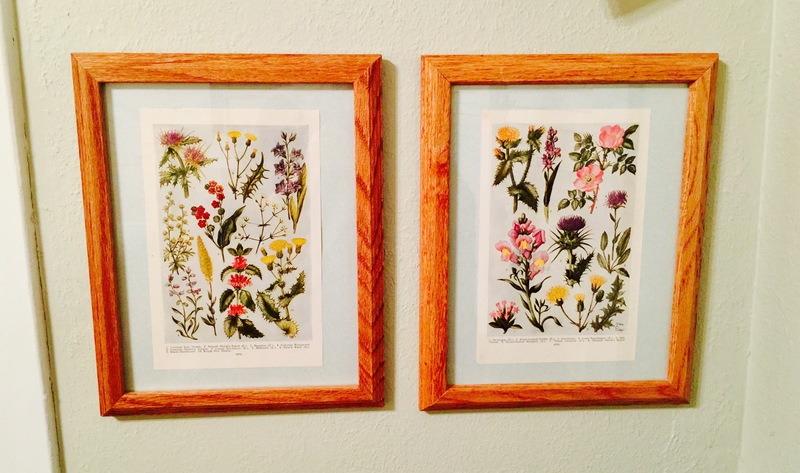 A paper cutter and double sided tape made mounting the vintage pages easy. Being a fan of wabi sabi…beauty in imperfection…I appreciated spots of slight discoloration on the pages and a crease or two. In a few minutes, I was fastening on the backs of the frames, and appraising my finished work. I am thrilled with how these framed prints turned out. They didn’t cost me a penny, as I used what I had on hand. I saved one of the pages for a future project. 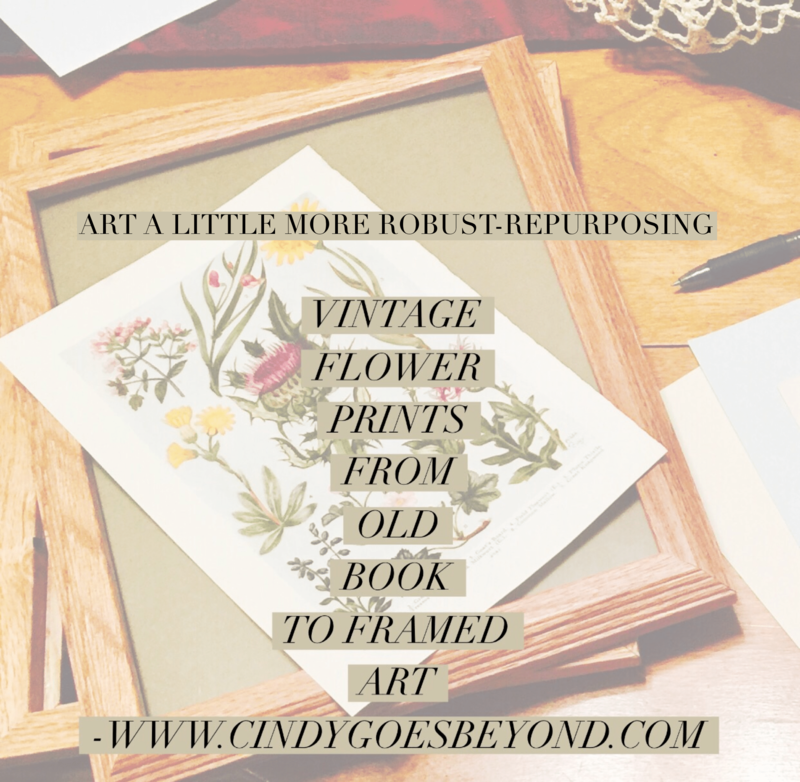 Repurposing is fun for me, and meaningful, as I create fresh art from something old that carries significance. I am grateful that we saved the encyclopedias and the Book of Knowledge set. They have given me much pleasure, and provided pages, literally, of inspiration. Obsolete books? No, they are art.